Park Guell is doubtless one of the most impressive public parks in the whole world, in which Antoni Gaudi let loose his imagination and created a fascinating color- and meaningful little world. 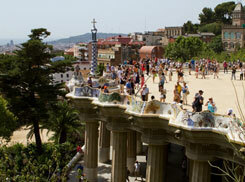 In 1900 Gaudi began with the planning and the construction of the park. The park was actually supposed to become a residential park for the upper class Barcelonas - this was the plan of the rich industrial magnate Eusebi Guell. But, however, the project became unsuccessful and from 1923 on the park was property of the city of Barcelona. Even though it never got fully completed - what Gaudi built until 1914 is more than impressive. Gaudi had really bad rheumatic problems when he was a child, so that he was not able to play with other children and spend most of the time in nature - observing stones, animals and plants. 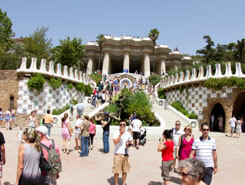 Nature was Gaudis biggest source of influence and this is conspicuous in his work - especially in Park Guell. Twisting rock pillars, that seems to grow out of the ground like trees, wonderful curvy lines, no sharp edges, colorful mosaic benches, a huge variety of shapes and forms, winding paths, quite unusual houses (Gaudi lived in one of them, now they are museums with a lot of interesting furniture designed by Gaudi), and beautiful Art Nouveau gates – this is Park Guell. And it offers one more thing: an incredible view over the city of Barcelona – the higher you go up the park the better. The most photographed and most famous object in the park is a smiling dragon, just right after the main entrance, which stretches in the middle of the divided stairway. 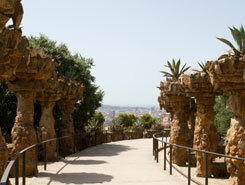 In 1994 the Park Guell became part of the UNESCO World Heritage Site called “Works of Antoni Gaudi”.